Candi Borobudur, or Borobudur Temple, as it is affectionately and popular known, is a 9th Buddhist temple in Magelang, Central Java, Indonesia. The main gateway to this attraction is of course Yogyakarta, the main city and capital of Central Java. 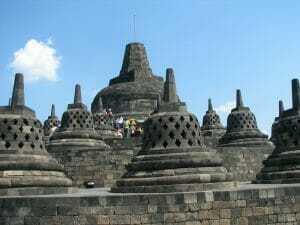 The Borobudur is the world's largest Buddhist temple and a UNESCO World Heritage Site. It's the single most visited tourist attraction in the whole of Indonesia. If you're interested in similar Buddhist monuments that are also UNESCO World Heritage Sites, check out the ones in Tibet: Lhasa's Jokhang Temple, Lhasa's Potala Palace and Lhasa's Norbulingka Summer Palace. Some historical and background Borobudur facts that might interest you: The temple was constructed and completed in the 9th century at the peak of Sailendra Dynasty's regime of the Mataram Kingdom. Unfortunately, it was abandoned for centuries due to the decline of both Buddhism and Hinduism and the rise in Islam in Indonesia. 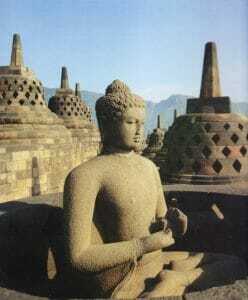 Borobudur Temple was buried and covered by volcanic ash and plantation for centuries. The temple has 6 square platforms, 3 circular platforms, 2,672 carved panels and 504 buddha sculptures. 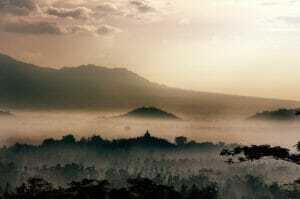 The Borobudur is situated on a bedrock hill that sits 2 volcanoes and 2 rivers. Please take note that getting a tour guide here is not compulsory. You have the freedom to explore the entire temple including the park surrounding it at your own pace & time. There is a shuttle/tram which goes around the entire park. You can hop on and off at certain checkpoints. As the temple is open from 6am to 5pm every day, the best time to visit Borobudur Temple will be during dawn at 6 am (for the sunrise) and dusk from 3pm onwards (for the sunset). Not only will the weather be cooler during these times, you will also be offered a captivating view of both man-made architecture and nature. Like most other attractions and destinations, you'd be wise to visit during the weekdays and avoid the holiday period. In terms of season, you'd want to visit during the dry season (April to October) rather than the rainy Season (November to March). For those who are planning to witness the hypnotizing sunrise, consider staying at Manohara or Amanjiwo Resort. This way, you wouldn't need to wake up too early and spend more than 1 hour of travelling time like if you were to stay in a city hotel. Take the 2A & 2B Trans-Jogja public buses from Yogyakarta city centre to Jombor bus terminal. It will cost you Rp 30,000 (S$3, MYR9, USD2). From there, look-out for signboards of buses that are going to Borobudur Bus Terminal. The cost of this one-way bus ticket will be Rp 20,000 one way (S$2, MYR6, USD1). Take note that the bus will not stop directly at the compounds of Borobudur Temple. The exact stop is at least 5 minutes’ walk away from the temple grounds. The entire one-way journey from Yogyakarta city to Borobudur Temple may take up to 4 hours by public transport. 2. The second and more convenient way on how to go to Borobudur is to rent a car with driver. The cost may range from IDR 400,000 (S$40, MYR120, USD30) to IDR 800,000 (S$80, MYR240, USD60), depending on the type of car and destination. Do take note if the quoted cost to you includes driver's meal, fuel, and parking charges. We'd recommend that you consider getting a full-day Yogyakarta car rental with driver rather than getting a one-way or 2-way trip to just 1 attraction. From Yogyakarta City Centre, it is less than 2 hours’ drive depending on traffic. Thus, if you are planning to catch the sunrise, be prepared to standby at your hotel lobby by 0300-0400am (do check with your driver). 3. The third and the most convenient, comfortable, & comprehensive method would be to settle your Borobudur trip in advance by getting a 3D2N Yogyakarta Borobudur & Prambanan Tour Package, 4D3N Yogyakarta Borobudur Sunrise & Mt. Merapi Tour Package, or Customized Yogyakarta Tour Package.